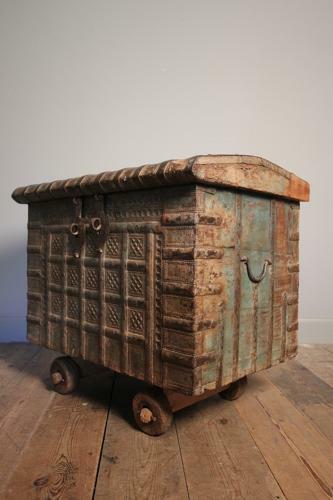 A mid 19th Century solid Teak & Iron banded trunk, Indian in origin and typical of the Rajasthan furniture of this period. Retaining the original side carrying handles, hinges, lock and engraved leaf shaped hasps and wooden wheels. The blue painted front covered in iron with foliage decoration and engraving. Wonderful condition, colour and patina throughout.